Why are there so many versions of the Quran? In the early 1980s, I was enrolled in an Islamic Studies program at the University of California Los Angeles (UCLA). In one class we had to read the Quran several times. The first assignment was to read the Quran and note how many times Muhammad was mentioned and describe the context. The second assignment was to read the Quran again and note how many times Moses and Abraham were mentioned and describe the context. Other similar assignments followed, resulting in re-reading the Quran and discovering some interesting facts. Moses is mentioned in 502 verses and Abraham is mentioned in 245 verses, while Muhammad is only mentioned four times. In another class, we had to read several translations of the Quran including those by Alexander Ross (1649), Abdul Hakim (1905), Ghulam Sreawar (1929), M. Pickthall (1930), Richard Bell (1937), Ahmed Ali (1964), and others. The results were astounding. Even the most basic of verses differed. My fellow students and I drew some amazing conclusions and our final term papers were research projects delving deeper into why translations vary. While attending UCLA I noticed a massive influx of Muslim students. Every semester there were more Muslims and more Muslim "events" were being held on campus. Not long afterwards, those two classes were removed from the program. Why? Because they pointed out some serious flaws in the Quran and brought doubt to the belief that Muhammad was a prophet. I eventually moved to Cairo, Egypt where I enrolled in Arabic classes and Linquistic classes at the American University in Cairo and furthered my studies. Through my studies, and then my work as a researcher at the Ministry of Culture, I learned that the Quran was originally a Christian liturgical book written in Aramaic. What is known as the Quran today was an evolving piece of literary work which changed into a "control tool" for the Abbasid caliphs (r.750-1250). The first Qurans were in Aramaic and changed over time as written Arabic was being created. The Arabic used for the Quran is a written language only. No one speaks Quranic Arabic. No one has ever spoken Quranic Arabic. What most people do not know is that there is an Egyptian Arabic, Lebanese Arabic, Moroccan Arabic, Jordanian Arabic, Tunisian Arabic and so forth -- all drastically different dialects that are not understood by one another. Quranic Arabic is even more drastically different from the various dialects. It differs in vocabulary, grammar, word formation, etc. Anyone who reads an Arabic Quran has to first learn Quranic Arabic like learning a second language. As the Quran evolved and changed into Quranic Arabic, many Aramaic words remained, which caused great confusion later as "scholars" studying the Quran could not figure out the meanings of many words. They were reading the words as Arabic, when the words were actually Aramaic. 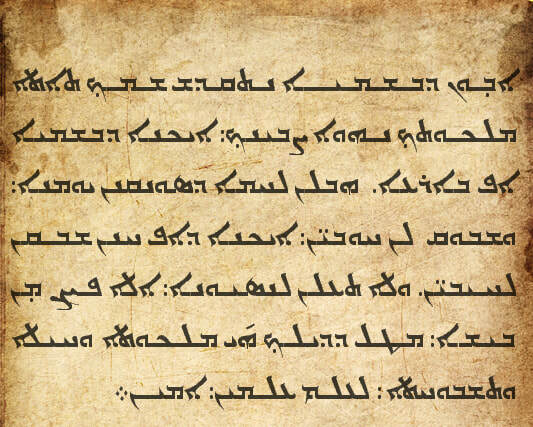 Added to the problem of the Quran continuing to be partly in Aramaic, the early Arabic Qurans did not use diacritical marks (dots and markings that distinguish consonants from one another). The early Arabic Qurans also did not have vowels. Without diacritical marks to distinguish consonants, and no vowels, the earliest Qurans in Arabic were incomprehensible. The first Qurans in Arabic did not have vowel markings because a vowel system had not yet been created. There were only consonants. But the consonants without their markings could not be distinguished from one another. An Arabic consonant can be changed into a different consonant just by adding one dot, two dots, or three dots. These markings came to be written and codified at a much later time. Many Arabic consonants have the exact same shape. The only thing that can differentiate one consonant from another is the markings. Adding a vowel and consonant markings created many possible variations for just one word. Imagine an entire Quran written without consonant markings or vowels! The grammar, syntax and vocabulary for Quranic Arabic were created and defined in the ninth and tenth centuries. The Quran was in a constant flux for 150-200 years. During the first centuries of the Quran's creation, it continued to be deciphered. And this was the beginning of the wide range of interpretations and the vast amounts of commentaries made on the meaning of the Quran. It was also the period when the Quran was changed, additions were made, and the text was edited to suit the rulers at the time. Debates developed. There were those who said the Quran was the uncreated and the Eternal Words of Allah, and those who said the Quran had to have been created because they knew about the developments of an evolving Quran and the creation of written Arabic. Under the Caliph Ma'mun (r.813-833), the view that the Quran was “created” became orthodox doctrine. By the late 900s, a system of Islamic intolerance had developed and rulers began using the Quran to control people. The doctrine that the Quran was the eternal words of Allah became official with a death penalty to anyone who questioned it. Below: A sample of how an un-marked word can have several meanings by adding markings. In the example below, the exact same shape can mean: to plant a seed, a girl, a house, to hop, to broadcast; or, to settle. Below: A sample of Aramaic, an early Arabic Quran without markings, and an early Quran with markings. This translation is purposefully mis-translated from the Arabic. Without knowledge of the Arabic Quran, this verse sounds “peaceful.” But this verse is used in mosques around the world to incite hatred and violence against Jews and non-Muslims. But Israelites continued to commit mischief and corruption on the land. As you can see, in Arabic, the words "Israel" and "Israelites" are used. Jews are being warned that if they kill a Muslim, it is a crime of such magnitude that it is the same as if they killed the entire Muslim community (or village). According to Islamic Doctrine, “mischief” or “corruption” of the land is when someone disobeys the laws of Islam. The only time a Muslim can "lawfully" be killed is when it is according to Islamic Law, such as for apostasy, or when a Muslim kills another Muslim (an eye for an eye). A non-Muslim is not allowed to kill a Muslim under any circumstances. But if a Muslim kills a Jew or a Christian (or any non-Muslim), it is not considered unlawful, so there is no punishment. An attempt to undermine the interests of Muslims.